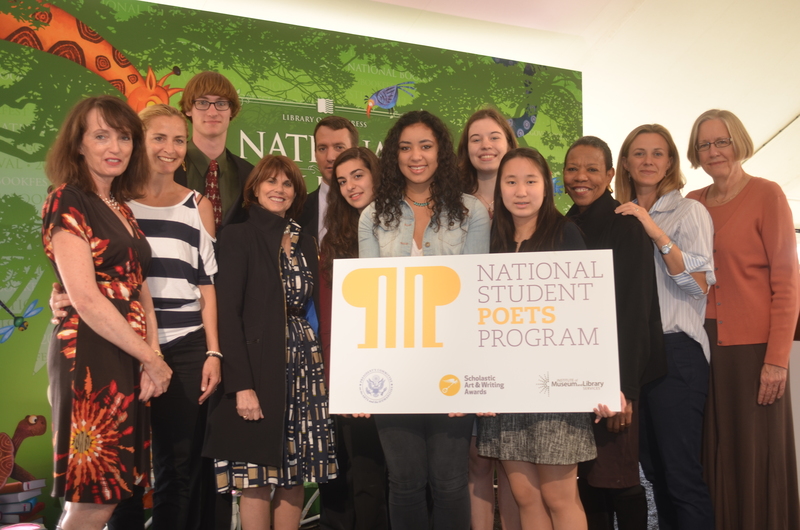 In continued celebration of National Poetry Month, here is an exclusive interview with the founder of the National Student Poets Program (NSPP), which awards the country’s highest honor for young poets. Currently in its first year, the NSPP will annually honor five poets selected from the Scholastic Art & Writing Awards national medalists. The awardees will serve as literary ambassadors for poetry. The President’s Committee on the Arts and the Humanities (PCAH) and the Institute of Museum and Library Services (IMLS) partnered with the nonprofit Alliance for Young Artists & Writers to make the NSPP possible. Below, founder Olivia Morgan gives us insight into the NSPP’s creation and purpose. NEH: How did you get involved with the National Student Poets Program? MORGAN: I founded the NSPP. My professional work centers on women and girls, and when I was appointed to the PCAH I really wanted to do something with that honor. I felt called to engage youth in the work of the committee, and the PCAH has been really focused on the impact of arts education on kids in schools. Research shows that students engaged in school through the arts have better attendance, have better performance, better likelihood of graduation. So I thought about how we could do that in a way that doesn’t require great resources, and the amazing thing about poetry, or writing of any kind—you don’t need musical instruments, you don’t technology, it’s just a pen and paper. So anybody could do it, and it could translate into a life skill that would benefit you for a lifetime: that ability to recognize something, to observe the world in which you’re living and communicate it, whether to yourself or others. From its inception, the program has had two goals: to recognize the value of the existing talent of our most dedicated teen poets and then to use their unique voices and experience to reach students and whole communities that don’t already have outlets and programs and pipelines to national support and recognition. Because what we realized in developing the program, the students that by and large are already writing poetry, they have great resources. Not all, some of them will say it was their school program that brought them to poetry, and others will say there was no poetry in their school, there were community programs. Or some of them will say it wasn’t their school or community, it was their parents. But the people I carried with me in my mind through the development of the program—I had this visual image of teens that have notebooks cramped with writing, but they’ve never shared it with anyone. They have these colorful images in their brain, but they’ve never yet put pen to paper, or their fingers to the keyboard to let them take shape on the page. We really want to reach those students, so their ideas have an outlet, so they learn the craft of writing and expression. And our culture is made more relevant and complete with the addition of their perspective. From right to left: Susan Hildreth IMLS, Olivia Morgan PCAH, Mary Schmidt Campbell PCAH vice chair, NSPP Claire Lee, NSPP Luisa Banchoff, NSPP Natalie Richardson, NSPP Lylla Younes, Jon Carson, Margo Lion PCAH Chair, NSPP Miles Hewitt, Ami Aronson, Bernstein Foundation, Virginia McEnerney, Alliance Young Artists & Writers. Courtesy of the PCAH. NEH: What was the process in getting the program underway? MORGAN: It was a long process. We started with a series of workshops with 826 DC. 826 was founded by the novelist Dave Eggers in San Francisco, and they now have programs around the country. They had literally just opened a storefront in Washington, D.C. in Mt. Pleasant, called the Museum of Unnatural History. In the back, there’s a writing workshop. It’s where teens from anywhere in the city can come for help with their homework, with writing, and they also hold writing workshops. Together with 826DC we put together a three-month series of workshops with students from four area schools. Students from each of those schools came every Wednesday night, and we did a poetry workshop. It was led by a poet-professor from Georgetown University, Carolyn Forche, and Kyle Dargen from American University; they put together the curriculum and they would lead the workshop, and other local poets would also come on Wednesday and help lead the classes. So we did this workshop for months and ended with a book of their poems that culminated in a reading at the Library of Congress. Secretary of Education Arne Duncan came, and Dr. James Billington, the Librarian of Congress, and Washington poets. The poets came and talked to these kids about how they came to be poets, and what that life looks like and what their inspiration is. Two of our student poets from 826DC read and just blew them away. It was such an amazing, heartfelt experience, they just poured themselves out. It was so moving. Then we worked with the White House and put together a poetry workshop in the State Room, so we got our students from 826DC, and we contacted similar programs around the country and invited them to bring their students. We had 80-100 students from writing programs around the country in the State Room for a workshop with Billy Collins and several other poets. It was good to be recognized for the time they spent learning a craft, and honing their skill as writers. One of the students who read that evening in the East Room—the White House had a formal poetry reading that night—was a Scholastic Award Winner, and I had spent some time with her on the phone, inviting her to perform at the White House. Then when she nearly fainted, I was working with her to prepare to read. This is someone who had won a poetry award, but she had never read her poetry; it had never existed except in her mind and on the page, so we worked on how she was going to vocalize it, and she pulled it off. It was amazing. I got a letter form her mother afterward thanking me and saying it had changed her daughter’s life because she now saw herself as a writer—that was her identity, and she had so much more confidence. That really inspired me to see the NSPP through. It felt like a good indication that we were on to something. We partnered with the Scholastic Awards, the Alliance for Young Artists & Writers that oversees the awards. They already had a system in place, where they get over 8,000 submissions from student poets every year. That was the toughest nut to crack, looking for that partner. Poetry out Loud is a great model, but we knew we didn’t have the same resources as them. So partnering with the Alliance—the light bulb went on, because they already had the system in place. So what we’re able to do: they get their submissions, and then they send to us their top winners—their Gold and Silver winners—and we decided not to have one national student poet, but to have five, and make it regional. First of all, being the only national awardee was a lot to put on the shoulders of a 16-year-old. Secondly, we didn’t want it to be just a title, but for it to be an active position and for the awardees to be engaged with their communities. We wanted to spread that across the country. We do it regionally, and we took the scholastic winners and found five just extraordinary young poets for our first class of NSPP awardees. And they are amazing, they’re so earnest and talented and excited about the opportunity. They come from all over the country, and all different backgrounds. From a military family to NYC to rural Louisiana—just all over the place. We didn’t choose them based on their geography. We assembled the talent into five regions and selected a winner from each region. Their charge had been to look for communities where there isn’t already a flourishing poetry scene and to bring it there. I have to say, the Institute of Museum and Library Services, along with the Alliance, have been equal partners with this. And the Institute really gave us a home for this. Without them, we wouldn’t have been able to do it. And the Library of Congress has been extraordinarily supportive. 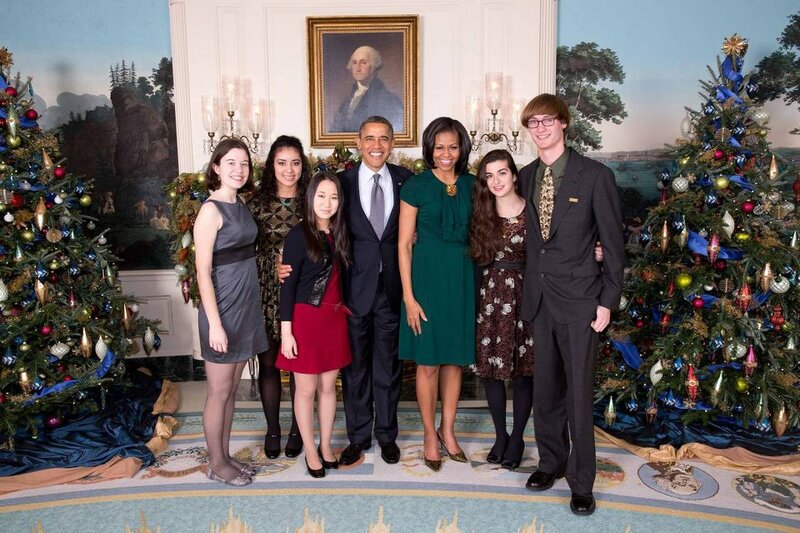 President Barack Obama and First Lady Michelle Obama greet the 2012 National Student Poets, Luisa Banchoff, Natalie Richardson, Claire Lee, Lylla Younes and Miles Hewitt in the Diplomatic Room of the White House following a Christmas holiday reception, Dec. 14, 2012. The First Lady is an Honorary Chairman for the PCAH. Official White House Photo by Lawrence Jackson. Courtesy of NSPP’s Facebook page. NEH: How do you see this award compared to the Poet Laureate program? Does it stem from the same idea? MORGAN: Well, certainly the Poet Laureate program was a model, but it’s very different. That’s recognizing someone for remarkable contributions they have made and continue to make to American culture. What the NSPP is doing is really encouraging students—recognizing students who are already writing—and valuing that work, and really looking for the finest student writers. It then engages these young writers in the work of finding other students who aren’t yet writing. The awardees have gotten amazing experiences. They were invited to the Dodge Poetry Festival, which is the largest poetry festival in North America, which had never had high school students read before. All of them are doing community projects as part of their service. In April each of them participates in a National Poetry Month event in their region. Then they also take on a service project to bring poetry to a community that doesn’t already have an outlet. They’ve done that in totally different ways. For more on the NSPP’s individual work and service, please return to the blog Friday for a post about the five NSPP awardees. These young poets now realize that they have a responsibility. They have a gift, and resources are being invested in it. So they have to encourage others to develop their gifts as well. They each have organized one community service event somewhere in their region. The students are so different, and their regions are so different, the projects have taken on different characteristics. NEH: Other than the connection to the Alliance for Young Artists & Writers, were there other deciding factors to give this award to high school students instead of college students? MORGAN: We were really focused on K-12 education, and helping students at that age level, and actually the award only goes to 9-11 graders. The reason for that is we wanted our Ambassadors to still be in high school. We’re in the process of selecting 2013-2014’s winners now, because the Scholastic awards were given in March, so we know who the top poets were this year. The new NSPP’s will begin in the Fall of 2013, and the award ceremony takes place during the National Book Festival this coming September. That kicks off their year of service. We’ll do workshops with them, with the new NSPP awardees, around that weekend, when they’re inaugurated. So that they’re comfortable on the stage, and they understand the opportunities and obligations of their roles, and then they do their first reading on the mall. We wanted the students to still be in high school because we thought they’d have the most credibility with their peers, and again this comes back to the idea that the more engaged students are in their academic work, the more likely they are to stay in school and graduate. It wouldn’t be possible without the Library of Congress, they put it all together, the Center for the Book and the Poetry and Literature Center. NEH: How do you see this award affecting these students as they graduate high school and move toward college? MORGAN: I’m sure it has given them respect for themselves as writers, and certainly an understanding that, as they have this talent, and these resources have been invested in them, with that opportunity comes an obligation. I go back to the idea that artists and writers really add to the fabric of their communities. In this case, we were asking them to work with their peers, with other students, and help them hone their own writing skills and see the benefits of written expression. I hope they will take that forward in their lives. They are talented writers, and with that talent there’s some obligation to contribute to the greater good. Olivia Morgan is the managing editor of the Shriver Report and the founder of the NSPP. Morgan is a Private Member of the PCAH. Please visit our blog again next Tuesday (April 30) to learn more about the five NSPP awardees. This entry was posted in Uncategorized and tagged community, culture, D.C., education, humanities, Institute of Museum and Library Services, learning, Library of Congress, National Endowment for the Humanities, National Poetry Month, National Student Poets Program, NEH, NEH Office of Congressional Affairs, poetry, poets, President’s Committee on the Arts and the Humanities, research, resources, Scholastic Art & Writing Awards, youth poets by nehblog1. Bookmark the permalink.